In HubSpot, properties store information about a contact, company, deal, or ticket. Your HubSpot account includes a number of contact, company, deal, and ticket properties by default. However, you may need additional properties to gather information for your business's marketing, sales, and service processes. You can have up to 1,000 properties per object, including default properties provided by HubSpot. Click the tab of the object type to create the property for. Label: a brief description of the property that will appear internally on records. The label will also be the external default form field label for the property when used as a field on a HubSpot form. Internal name: the API identifier for the property. This is unique and not editable once the property is created. It's automatically determined based on the original label that you set for a contact property. 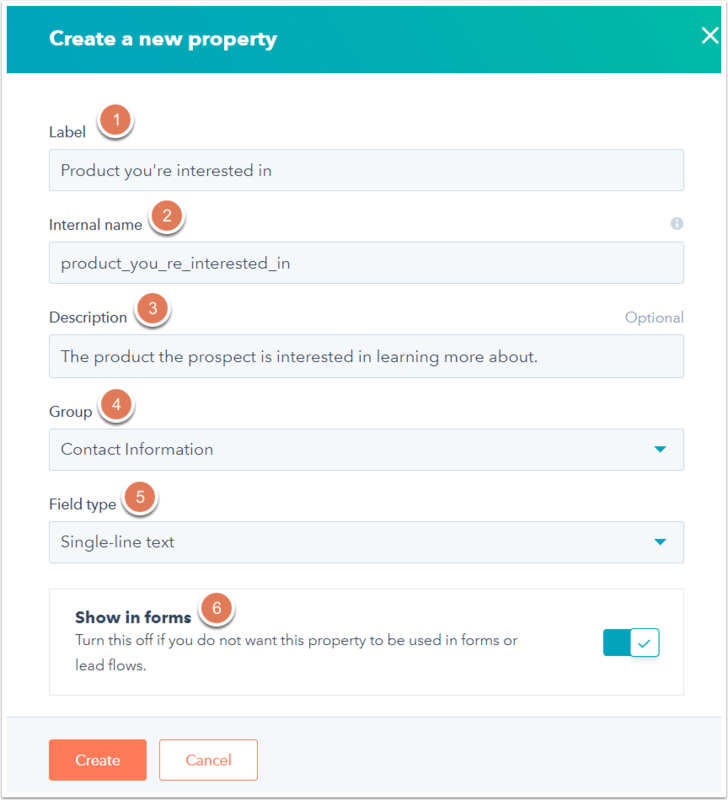 If the custom property is created by the Salesforce connector, HubSpot automatically appends a "__c" to the end of the HubSpot property name (Salesforce custom field names also use the same naming convention). Please note: when the error A contact property already exists with that name. Please try a different name. appears, the current internal name is already used. Update the current property's Internal name to save your new property. Description: a short explanation of the property for internal use only. Group: your properties are all stored in groups so that you can keep them organized. Select a default group or one of your custom groups. Field type: select a field type for your property based on the type of information you'll be gathering. Please note: once a Score, Calculated, or Date property is created, its field type cannot be edited. Show in forms: this is enabled by default. Clear the Show in forms box if you don't want the property to be available for use in forms, pop-up forms, and bots. Add to search (Enterprise only): if you are creating a single-line text, multi-line text, or number property and you want users to be able to search based on values for this property, select the Add to search checkbox. You can also set your custom properties to appear in the About section of records by default.